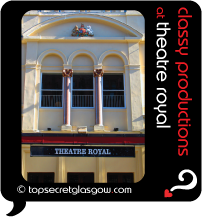 Theatre Royal is one of the jewels in Glasgow's crown of top theatres and venues for fantastic events. Shakespeare rubs shoulders with ballet and opera here. To make sure your evening deserves a standing ovation too, its important for you to choose the best place for some pre-theatre dining, and hottest bars for a drink before or after your show. If you're visiting Glasgow for the show, you'll need somewhere to put your head down for the night. This is very important as well. To keep your evening hitting all the right notes, here are excellent places for you to consider - whatever your budget. Get your evening off to a fun start, with a meal in a laid back restaurant that rocks - and you might not even know for sure about these local gems. Close to Theatre Royal, Red Onion /Browse/Restaurant/Red_Onion(reveal best table deals?) promises something a little different. The owner used to be caterer to the stars, traveling the world with them. He uses his experience to inject unusual dashes to the menus. The result is a mix of classics and a few dishes you cannot possibly resist. Fun times are waiting in Red Onion. If your night at the ballet or opera (or Shakespeare!) is a Big Date, you're spoiled for choice when it comes to intimate pre-theatre dining around here. For lovers of top quality Scottish fish and seafood, Gamba /Browse/Restaurant/Gamba(reveal best table deals?) will catch you in its fishing nets, if you're not careful. Knowing how to make the best offered by the waters off Scotland, this golden glowing little restaurant is a fave with locals in the know. Make sure you check out the specials of the day. These really do chance on a daily basis, depending on what's the best of the day's catch. In the mood to keep the party going? Has your show got you excited and in the need for a chatter in a lively crowd? Cool! A true local gem hides in a concrete jungle, near the M8. In a spot that only 1960s planners could come up with you'll find the wonders of Baby Grand Charing Cross /Browse/Restaurant/Baby_Grand_(Charing_Cross)(reveal best table deals?) . The ivories of the real baby grand piano might be tickled while you're there. Always a fun place, locals who know a good thing love Baby Grand... where the party never seems to stop. The class and style of the show at your theatre can be matched by a sophisticated drink in one of the lovely local bars close by. One shining bar in Glasgow city centre feels a bit like a champagne bar off the beaten track in Paris. The one and only Vroni's dazzles - all shining mirrors, candles, a creaking wooden floor and more bottles of fun than we know what to do with. For a chat with friends before or after your show, they don't come better than here. For a head spinning cocktail list and the chance of live soul or jazz into the wee small hours, your evening will carry on in spectacular style at Blue Dog . Easy to miss, take care tracking this fab place down, and you'll be in late-night heaven. 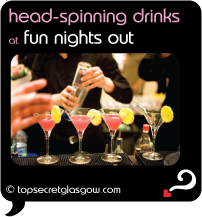 If you have time while in Glasgow, why not visit one of the many quality attractions in town? Round the corner from Theatre Royal stands the dramatic tower of Marks Hotel /Browse/Restaurant/One_Ten(reveal best table deals?) http://www.laterooms.com/en/p8275/hotel-reservations/99378_marks-hotel-glasgow-glasgow.aspx(reveal best room deals?) . Strong style and good taste ooze from this confident city centre hotel. For lovers of boutique designer rooms and top quality service, this place ticks every box. 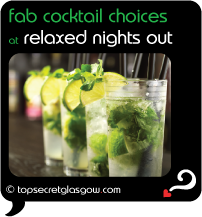 Glasgow makes sure you have a great time no matter your budget. 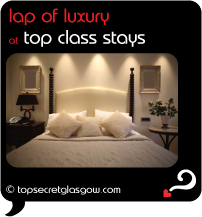 Top stays offering excellent value for money can be found close to Theatre Royal. On Renfrew Street, Alba Lodge http://www.laterooms.com/en/p8275/hotel-reservations/149232_alba-lodge-glasgow.aspx(reveal best room deals?) welcomes as a family run guest house where cosy nights are top priority. 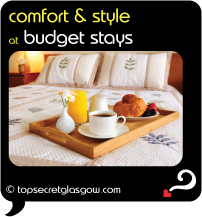 Perfectly placed to allow more exploring of the city, this makes a top budget place to stay in Garnethill. How was your show? Bet it rocked! How about sharing your memories and best stories about your evening at Theatre Royal? 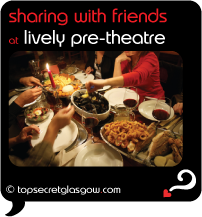 Drop us a line [here] and we'll publish your very own Top Secret Glasgow web page. Then you can impress your friends with how generous you've been...;-) And we'll do this completely free. Great news! Finding this page means you can now join our VIP list for Theatre Royal. Grab your very own web page all about Theatre Royal. Do you have a special story about Theatre Royal? A funny experience? A grand occasion? A funky photo? A personal tip? A top secret? underground Cowcaddens in the hood! The venue opening varies to suit the advertised time of each event. Check your tickets for details.